By John Counts Crime and courts reporter Posted on Thu, Jan 24, 2013 : 2:30 p.m.
Construction supplies lie on the ground as Ann Arbor firefighters check an opening next to the house and under a broken-out window after a house fire at 1800 block of Weldon Boulevard on Thursday. One room was destroyed and a house suffered a lot of smoke damage when it caught fire in Ann Arbor Thursday afternoon, authorities said. There were no reported injures. 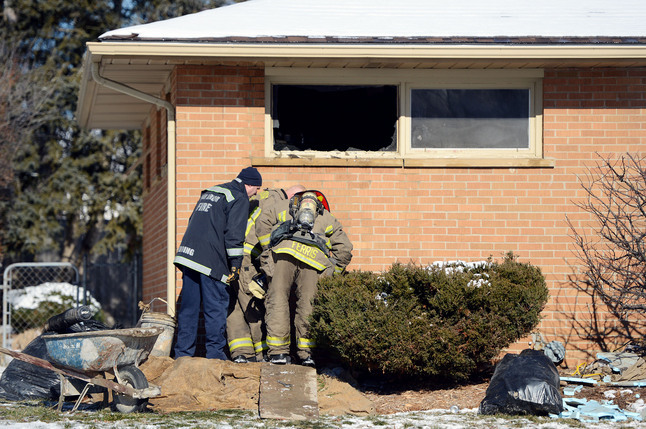 The Ann Arbor Fire Department was called to the home in the 1800 block of Weldon Boulevard around 12:30 p.m. after a crew working at the house smelled smoke, Battalion Chief Robert Vogel said. One of the rooms in the ranch house was on fire and burned badly before firefighters had the blaze under control within about five to 10 minutes upon arrival, Vogel said. A woman was evacuated from the house without injury. There was a lot of damage to the home and the woman, who lives at the home with her husband, will not likely be able to stay there overnight, Vogel said. 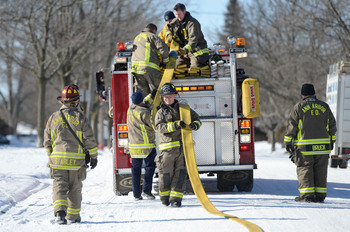 Ann Arbor firefighters back up a fire truck as they load up a hose after a house fire at 1800 block of Weldon Boulevard on Thursday. Vogel was unsure if Red Cross had been contacted for assistance and said the residents will likely make their own arrangements. Dave Barth, a laborer for Payeur Foundation, was working outside with a small crew to dig up and repair a portion of the water system when the crew noticed smoke. Barth said he went into the house and was startled to hear what he thought was ammunition going off in the room that had caught fire. "I went in and saw the smoke," he said. "As soon as we opened the door, the ammunition went off." Barth said it sounded like firecrackers, as did other members of his crew. Barth and the rest of his crew fled from the house with the homeowner. "It was time to get out of there," Barth said. Vogel said he couldn't say whether there was ammunition in the house, adding the investigation continues and that the cause of the fire is unknown at this point.